Princeton residents Georgette and Forrest Meggers ride bikes to school with their four young daughters nearly every day. Have a GREEN School Year! It's Back to School! Consider these sustainable tips throughout the academic year. According to Ms. Martha Friend, a science teacher at Littlebrook, "students will voluntarily monitor trash, recycling, and compost bins in the cafeteria to prevent contamination." 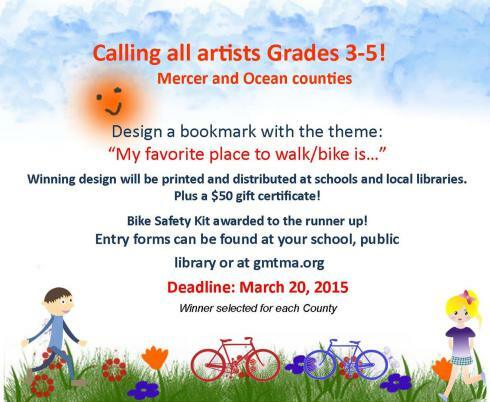 The Greater Mercer TMA (GMTMA) is sponsoring a children’s bookmark design contest to celebrate the NJ Walk & Bike to School Month, April 2015. The contest coincides with the Walk and Bike to School Month and hopes to get students thinking about walking and biking to school. The winner will receive a $50 gift card and a walking /biking safety kit. Winning bookmarks will be printed and distributed to participating school libraries and promoted through the GMTMA website and other media outlets. Create an original design including the theme: “My favorite place to walk/ bike is...” and return it to GMTMA by March 20, 2015. A winning design from Mercer and Ocean will be printed & distributed to schools and local libraries in each county. Each entry must be the original work of one child. No copyrighted images (characters, logos, etc.) or computer designs. Design your bookmark in the space provided on THIS entry form and return the whole form intact. Designs may be either vertical or horizontal. Any 2D art medium may be used (crayon, markers, colored pencil) No 3D materials (glitter, glued items, etc.) Designs and words must be dark enough to be reproducible. Please do not put your name anywhere on the bookmark. Contest ends March 20, 2015, 4:30PM. Contest is open to students in grades 3-5 who live in or attend school in Mercer or Ocean County, NJ. Winner selected by GMTMA staff. Questions? 609.452.1491 or tma@gmtma.org. Return form to: Greater Mercer TMA, 15 Roszel Road Suite 101 Princeton, NJ 08540. You may be able to return form to school to mail in bulk. Winners will receive a $50 gift card and walking or biking safety kits. Runners up will also receive safety kits. For more information, go to the GMTMA website. The date is set for the 8th Annual Living Local Expo where you and your family can meet your neighbors and catch up on everything green and local. Mark your calendar for Saturday, March 28th 11:00 am to 4:00 pm to stop by the NJ National Guard Armory at Eggerts Crossing in Lawrenceville. The Living Local Expo brings a wide variety of resources to educate and inspire residents to live a more healthy and sustainable life. Last year, over 1,500 participants were on hand to hear from the array of local businesses and other organizations that make Mercer County a standout sustainability focused community. This free event is organized by a volunteer committee from the Mercer County Sustainability Coalition, an alliance of the Green Teams and sustainability organizations in Ewing, Hopewell, and Lawrence townships, the municipality of Princeton, the City of Trenton and the Mercer County Office of Economic and Sustainable Development. Vendors can still reserve a spot and join other builders, architects, designers, local farms and food makers, transportation, schools and local organizations to promote the use of energy efficient products and sustainable local services. Last year, over 1,500 participants were on hand to hear vendors highlight their services and products through hands-on demonstrations or engaging conversations. For more information about reserving a spot, contact Tahirih Smith at tahirih.smith@gmail.com or send a check for a rental space of $50.00 along with the Vendor Registration form by March 9th, payable to: “Sustainable Lawrence”, PO Box 5612, Trenton, NJ 08638. You may also pay via PayPal. For more information go to the website: www.sustainablelawrence.org. PO Box 5612, Trenton, NJ 08638  895-1629. Speaking or presenting opportunities are also available. If interested, please contact Joann Held at joannheld@comcast.net to inquire about getting on the speaker lineup. OASIS (Organizing Action on Sustainability in Schools) is sponsoring a free Garden Tour on Sunday, September 28th from 1pm to 4pm. The tour will visit The Lawrenceville School Farm, Princeton Community Park School, and Princeton Friends School. At each school there will be a presentation by the garden/farm coordinator to discuss garden development and curricular tie-ins. There will also be time to tour each garden and ask questions after the presentation. Bus transportation between gardens provided courtesy of Chapin School. Meet at Chapin School, 4101 Princeton Pike, Princeton NJ for a 1pm departure by bus.